Participants can now select their team from the beginning of the session. The host can assign a color to a team. Participants will have a visual reminder to their team directly on their avatar. The host can now add and modify a slide without affecting the current presentation. They can also duplicate a slide and complete ongoing activities. To dedicate a perfect and more intuitive location to sessions&apos; main actions, the user account has been moved to the left side of the navigation. To make the full-screen functionality more accessible and to favor the use of two tabs by the host, the "Full Screen" action becomes the "Live session". It is moved to the top right side of the interface. Moderators can thus control their session through the first tab. They can use the "Live" view to display the second tab on their projection system. Discussions&apos; panel, slideshow, and zoom. To improve user experience, elements are fixed on the screen and they are no longer in appearance/disappearance mode when the cursor hovers over them. The personalization system has been completely redesigned. The host can display the following elements: a logo (ideally on a white background), a dominant color, an image or a color for the background of their projected screen. The dominant color is applied to the activity titles, as a reminder on the slides and as a banner on the mobile interface. Thanks to an integrated free library of high-resolution images and pictures Unsplash, the host can add professional photographs or even their own wallpaper to their projected screen. They can also preview the different interfaces impacted by their personalization choices: the interface on a computer, on mobile and on the projected screen. The lower display has been optimized to adapt the display time of messages according to the length of their text. The open/closed option: newly implemented in the session. 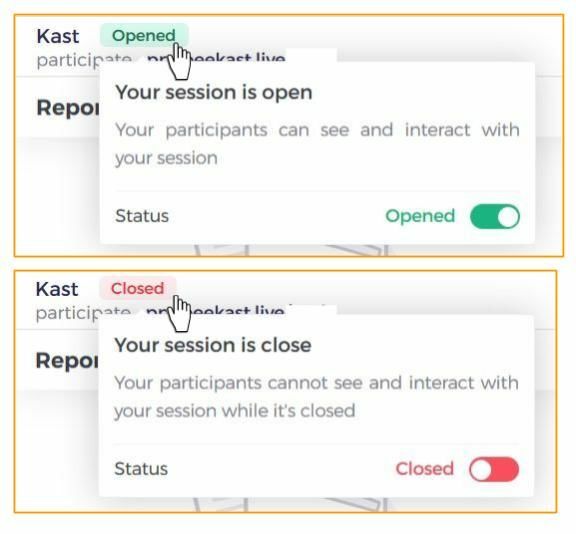 The host can limit access to their session and decide to re-open it to participants within a click. Participants will be redirected to a waiting page when they&apos;ll try to access the session. By default, sessions are open. 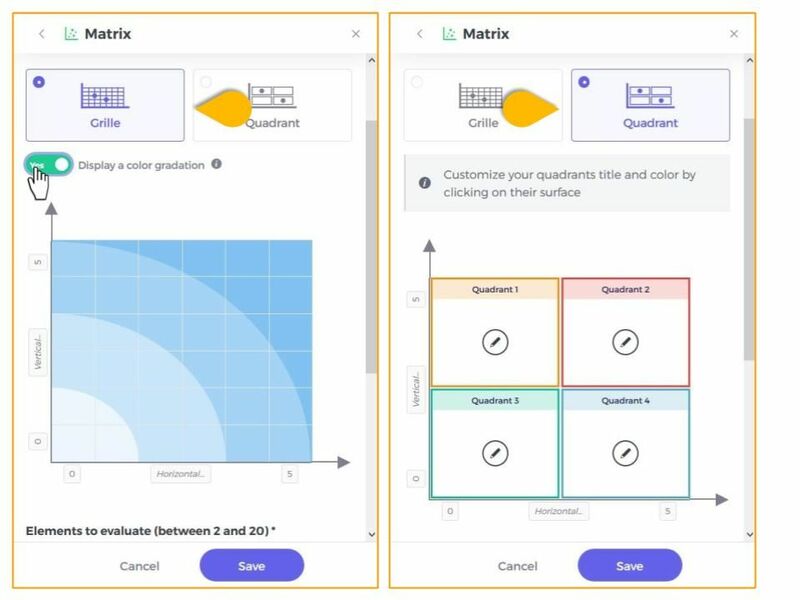 Improvement and optimization of Data in the report: Screenshots for "visual" activities such as the Wordle, the selfieswall or the matrix are available. Results of activities with tables are now much more complete. 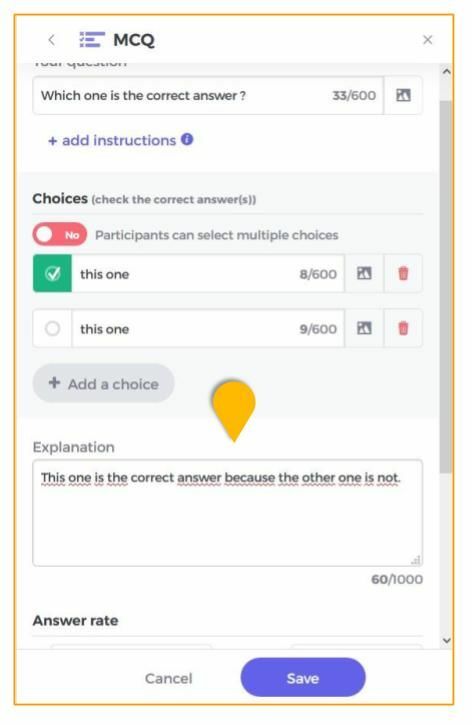 Now, participants can send their answer directly in the slide. 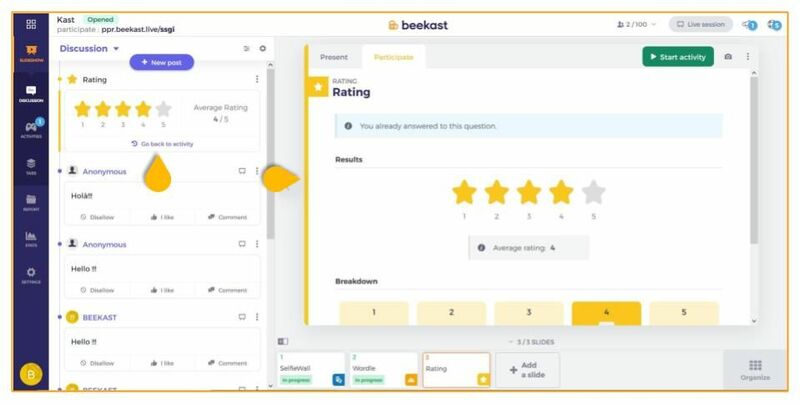 With the review mode, they can get back to their results and compare them with those of the group. They can review and participate in a deferred activity and return to the live presentation. The host can easily see what their participants will see, choose whether or not to participate in an activity. 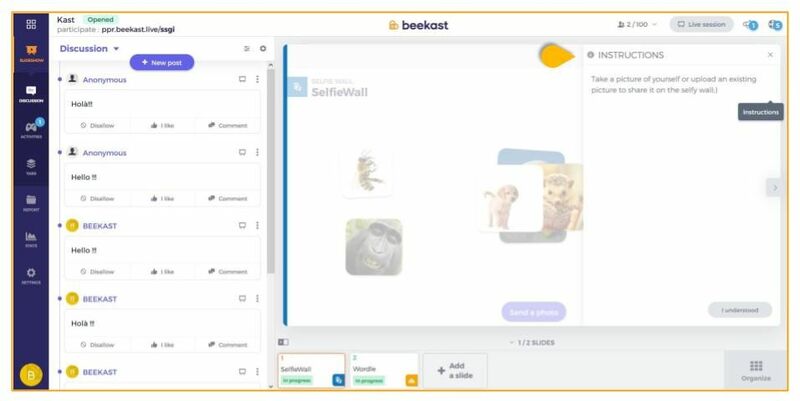 The default view for the host is the presentation view, their participation in activity becomes optional and is less interfering in the interface. 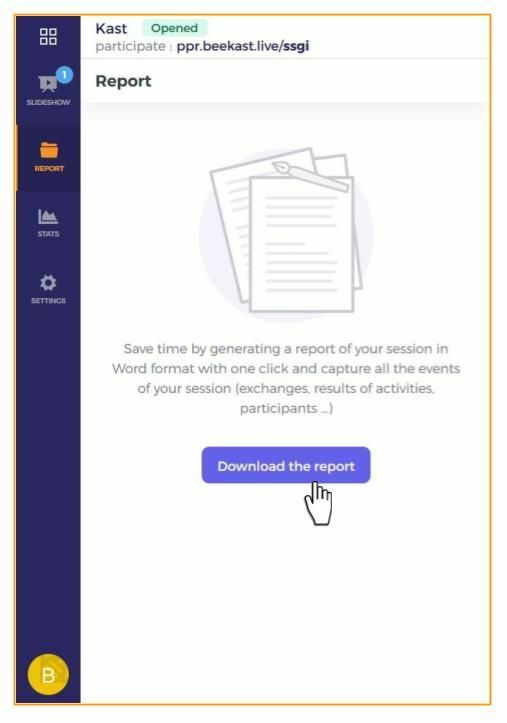 On mobile, participants are informed when they join a session with activities already launched. They can directly access ongoing activity via the notification. Now, if the instruction is entered, it will automatically be inserted under the activity title. For "full screen" activities such as the Board or the Matrix, the instruction is inserted in a panel so as not to take up the space of the activity. 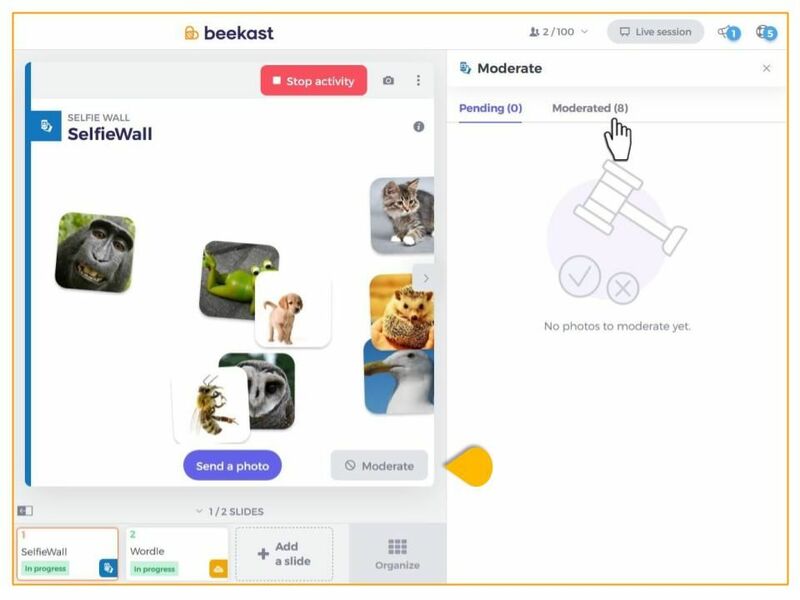 The moderation panel has been improved on all activities with this functionality. It is organized into two separate lists: elements pending for moderation and moderated elements. 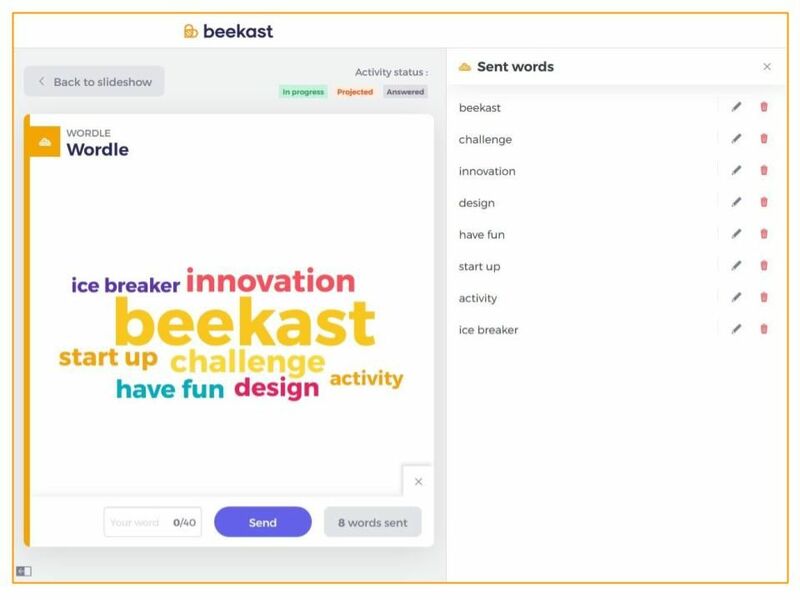 The moderator can edit the elements directly via this panel (for example, correct a mistake in a word sent on the Wordle) and their own propositions will be visually identifiable. The moderator is immediately notified about the propositions to moderate with a visual notification on the "Moderate" button. Participants can visualize the activity results. For assessment activities, there will be a summary with the good or bad answers. It will thus be possible to compare their answers with the expected ones. For all the activities, individual propositions will be situated in the context of the group. It is now possible to send words with space. A panel with the list of their own words is also available to the participant. 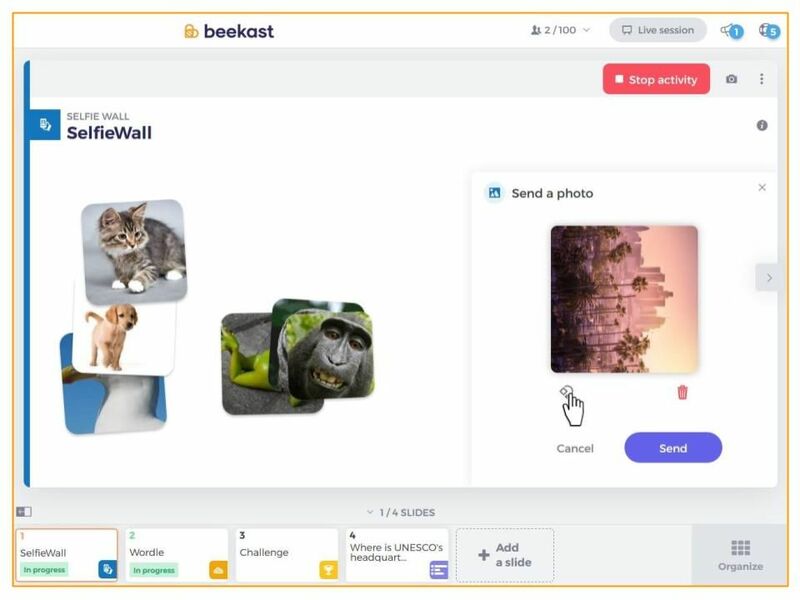 They will be able to delete or edit their proposition within this interface. The summary of the closed activity allows reviewing the Wordle and the list of the top 20 words. The result display panel has been improved so that to allow the host to visualize the distribution of the rates. 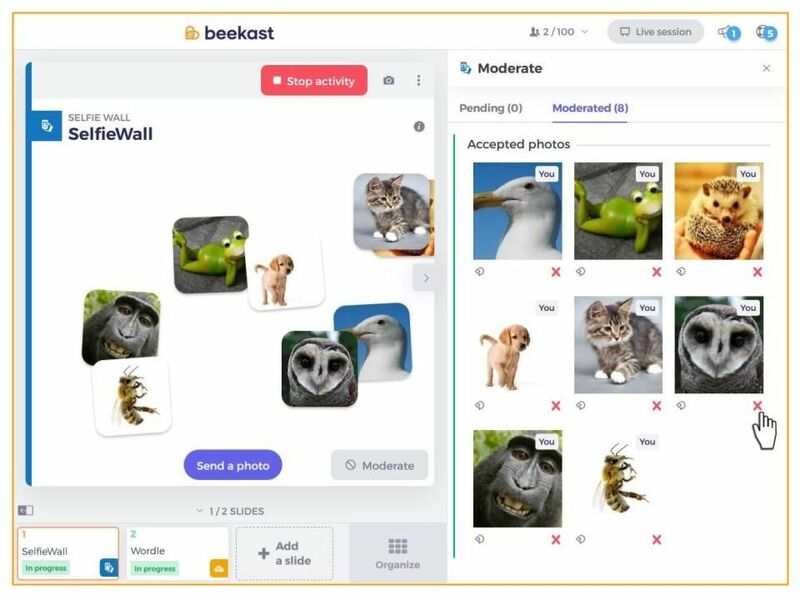 Participants can now rotate photos they have sent or even delete them. The host and the participants interact directly on the Board. The host defines the format of their brainstorming: Direct or Turn-based. 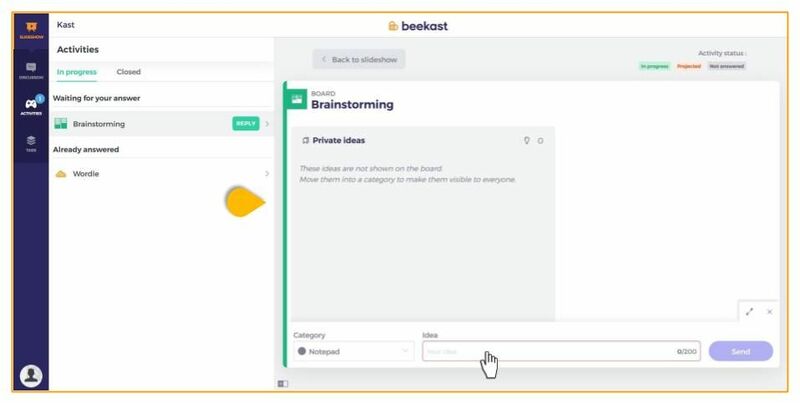 In Direct mode, participants automatically send their ideas to the board. In Turn-based mode, they have access to a personal notepad where they can organize their ideas before sharing them with the group. Host and Participants can now act on the cards: modify, change the color, group / ungroup, move to, refuse, delete ... via the menu of the card. The facilitator can create an empty group and move ideas around. The group also has a menu and can be directly edited (rename, ungroup, change color, move to and delete). The participant identifies their ideas directly on their board and their status when the moderation is activated. The Matrix is now available in two types: as in Grid or Quadrants. In grid mode, you can activate a gradient color background, ideal for running a risk management workshop. In quadrant mode, define the four zones (color and name) and propose a SWOT, Eisenhower or any other activity to your participants. You can also name the boundaries of your axes to explain your evaluations. Participants now respond directly in the matrix by moving their point on the grid or quadrants. The display of points has been redesigned to better manage adjacent points or the same value. 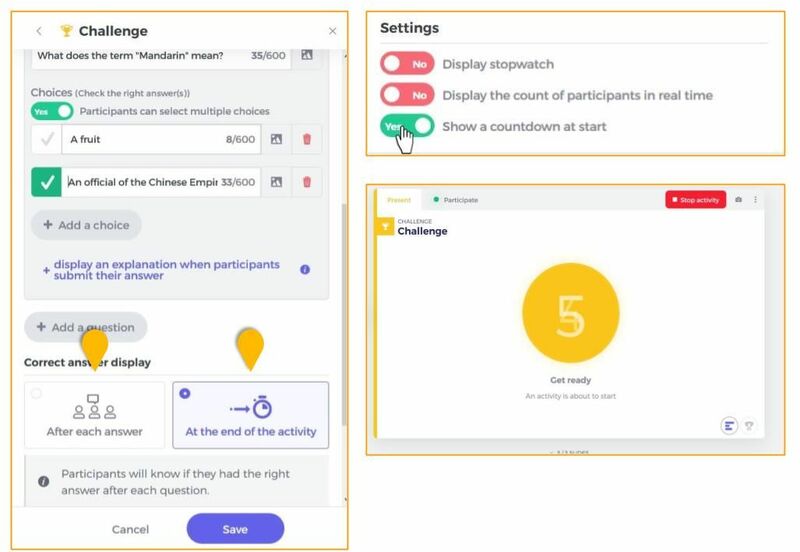 It&apos;s now up to you whether or not to activate the countdown at the start of your Challenge activity: useful to draw attention. 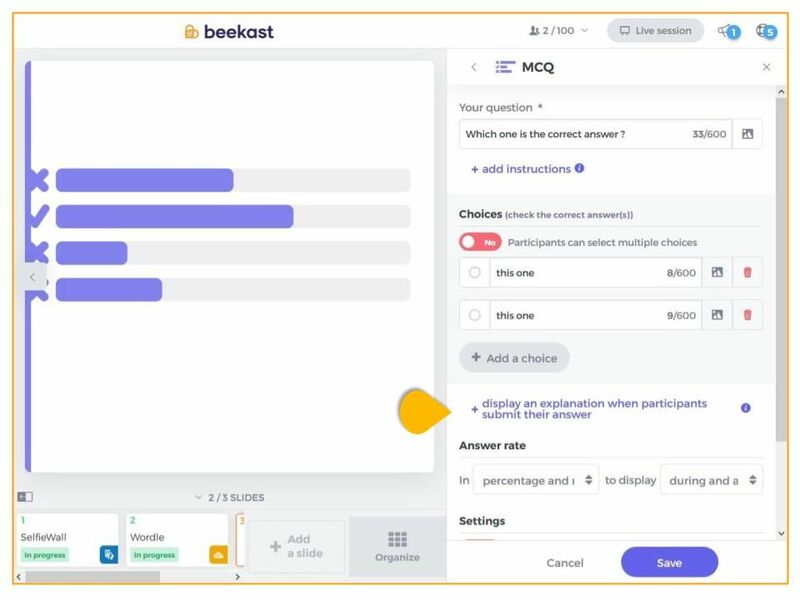 Once the activity is launched, your participants respond directly in the presentation: you choose to display the correct answers and their explanation when participants submit their answers or only at the end of the activity. 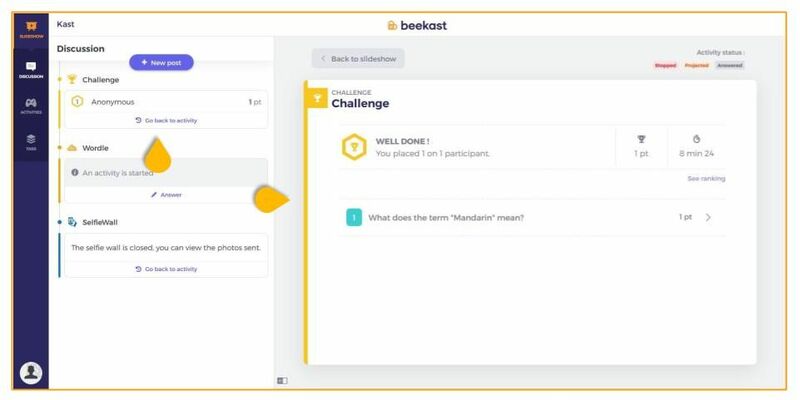 Throughout the duration of the Challenge, it&apos;s now possible to visualize the progress or status of participation on each question so that you can complete the activity accordingly. 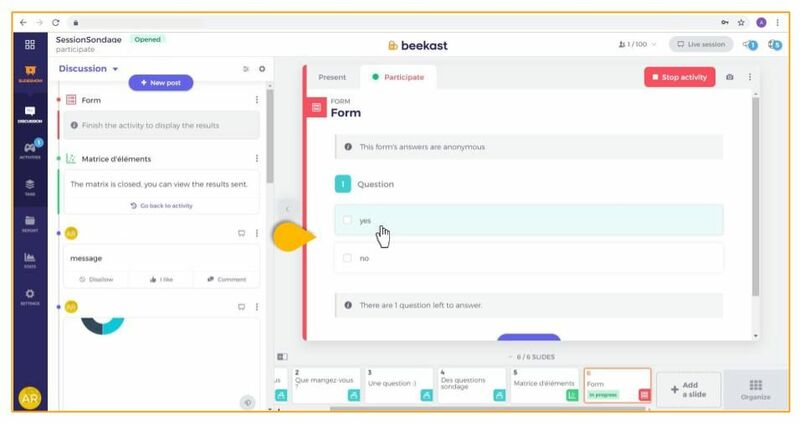 The host is now able to complete the activity know the status follow the progress of your participants on each question to know at any time the status of the participation and end the activity accordingly. The podium display has also been redesigned to better distinguish winners and teams. The Timeline has been renamed following users&apos; feedback. The "Timeline" space has been changed to "Discussion". More appropriate to the context according to the users&apos; feedback and easier to access for mobile users. It&apos;s now possible to moderate the comments when moderation is enabled in the Discussion space. 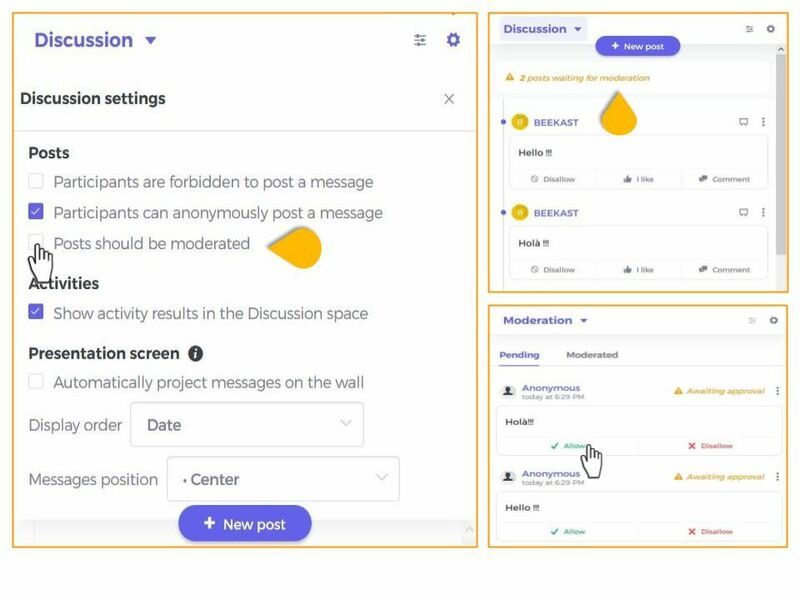 To make the moderation more contextual, the facilitator will be now able to see the comment within the discussion thread. 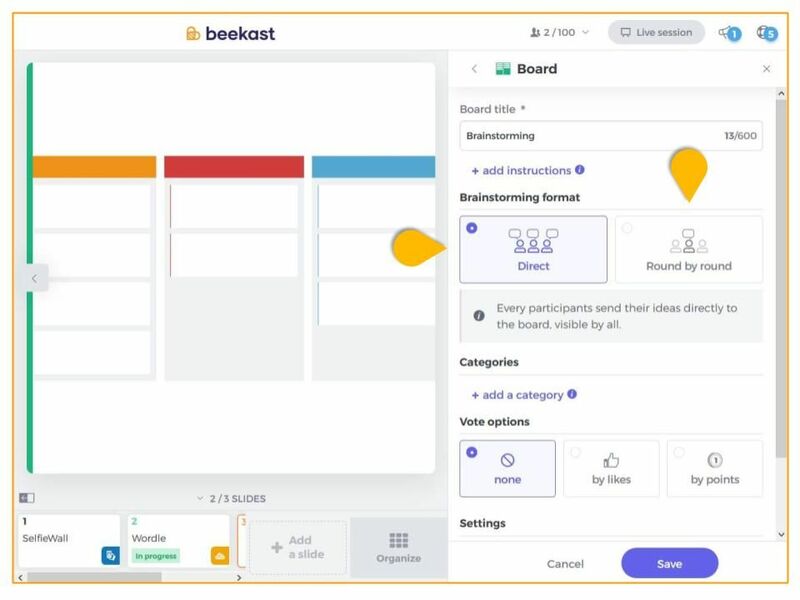 The result of started activities will automatically appear in the Discussion space at the end of the activity. Participants will be able to quickly visualize the question that has been asked as well as the answer given by the group.